The five-cent John J. 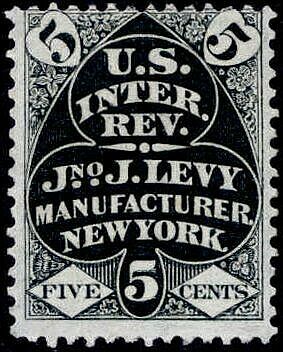 Levy stamp was issued from mid-March of 1887 through January of 1873. A total of 2,204,780 were issued on old paper and 920,060 on silk paper. The copy above was printed on old paper. The John J. Levy Company was in existence from 1853 and is known to have used first issue playing card and proprietary stamps prior to having its own printed. 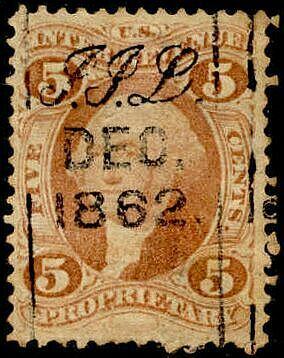 The December, 1862 date on this stamp would place its use during the period when five cents would have paid the rate for the most expensive cards, over 36 cents per pack.